I’ve always felt grateful to CEY for taking a chance on me when I was just getting started. Kudzu was instantly my most popular pattern on Ravelry, and it has held that position without serious challenge ever since. I’ll admit I was a little sad when the original yarn was discontinued. I’m so glad that CEY decided to have Kudzu re-knit in the soft and beautiful Cerro. The fiber in Cerro isn’t new — it’s been around as Mountaintop Canyon for about a year. Canyon comes in four natural un-dyed colorways. Cerro takes this fantastic base to twelve lustrous spring colorways — really delightful. It was great seeing you and the other helpful ladies this past Saturday during the snow storm. There is a great yarn shop near by son’s home in Jupiter Florida that I always visit. 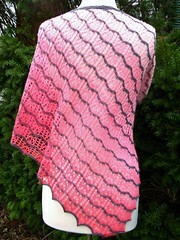 They support local dyers which use colors we dont see up north, most definitely will bring this pattern with me. Again congratulations oh being one of the Fiber finalists. Just putting the finishing tocuhes to your Crushed shawl. Know will get a lot of compliments on the plane. warm regards, dianne. for some reason I cannot get the free download.